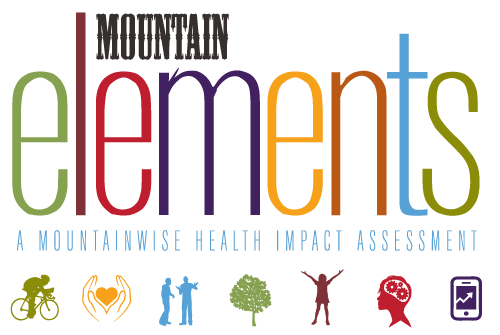 Our MountainElements project is focused on economic growth, job creation, mobility, access to nature, creating healthy conditions for citizens of all ages and abilities, and making sure future generations have a place to grow and prosper. We believe that communities are healthier when health and wellness considerations are incorporated into comprehensive county plans. An integral part of our MountainElements is our Hot Spots mapping. The regional “Hot Spot” maps were created to identify these pockets of poor health at the census track level. These maps can be used to identify populations most at risk, spot leading and lagging health outcomes, and pinpoint community conditions such as food deserts and walkability. Community health improvement planning is strengthened when you use data to identify populations most at risk. Grant applications are enhanced when that data is used to paint a picture of the conditions impacting health in your community through maps and other visualizations. These maps can identify priority populations for interventions to achieve greater health equity and better health outcomes for all. The maps for the MountainElements project were created with data layers from the US Census, the State Center for Health Statistics, NCDOT, and NC OneMap, with background layers from the US Forest Service and GIS software. The rating system is based on the US Census data at the census tract level, including diverse topics such as percentage of high school graduates, average age of residents, and racial make-up of the region. All of these factors were plugged into a statewide model that identified areas as having a higher or lower “modeled level of need.” The darker purple colors on the map indicate those Census tracts where the data indicates a Higher Prevalence of Poor Health Conditions when compared to other tracts within the MountainElements study area. The lighter colors indicate areas with a Lower Prevalence of Poor Health Conditions when compared to other tracts in the region. The maps can be found under the MountainElements tab. We encourage you to use our mapping system to assist you when applying for grant funding or creating county planning projects. Please contact us if you need assistance or have questions about the data found on our maps. Together, we can create healthier communities.